Just what we need. A pooing robot. Next year's must-have Christmas gift. Researchers from the University of Bristol have decided that simple batteries are not good enough and have taken it upon themselves to create Ecobot III - which draws its power through "digesting" sewage water and then dumping the waste. 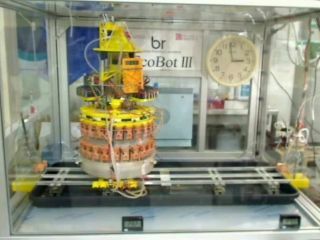 Ecobot III, also known as the BREADbot (Bio-Regulation and Energy-Autonomy with Digestion), draws power from 48 Microbial Fuel Cells that are refilled with digested nutrients that flow through an artificial stomach, then after 24 hours it does a poo. Imagine the hilarity in the lab when that happened for the first time. There's a video of the robot in action on the Uni's site, although you don't actually get to see it having a poo. Not that we were hoping to see that. We did not discover this news by Googling "pooing robot". The game Not Tetris is more kind-of-is-Tetris in appearance - only with all-new modern physics to ruin it. But ruin it cleverly and in an interesting way. The resulting bizarre mash-up of a game doesn't involve any line disappearing business or traditional rules, it simply presents players with the challenge of heaping as much rubbish up in the game screen as possible, while marvelling at "how far" we have "come". If the first thing you do upon entering a restaurant is glance nervously toward the kitchen to quickly assess the cleanliness of both premises and staff, you can now go through your obsessive compulsive hygiene checks before even leaving the house - thanks to new iPhone app Scores on the Doors. The maker of the app has been offering an online database of food hygiene ratings compiled by local authorities for some time, and now lets fashionable clean freaks scour the records of local eateries through the iPhone. You're even able to search its database by locality, if an officially recognised extremely hygienic preparation area is your #1 criteria when eating out. ToneCheck is a new automatic grammar checking tool that attempts to work out if your email voice is sounding too aggressive. It's basically a little plug-in for Outlook that scans your messages before you send them, popping up advice that you might want to delete some of those expletives before sending your email about the UNBEARABLE milk situation in the kitchen on the second floor to poor old Sally in human resources. There's a free demo on the maker's site, but it uses pre-written example text - you're not allowed to test it out with your own innovative swearwords.